Ask Yourself: What Are You Willing to Do to for Meghan Markle's Wedding Reception Gown? How badly do you want it? What are you willing to sacrifice? Ask yourselves these questions. Think this through. 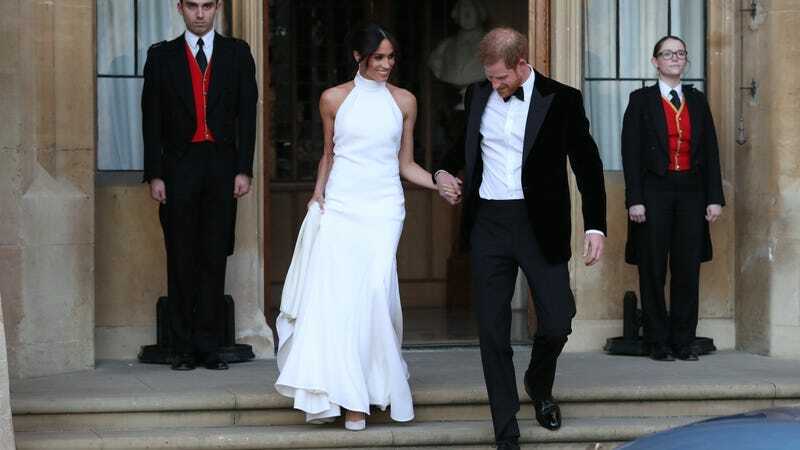 Stella McCartney, the designer responsible for the fun and floaty reception gown that Meghan Markle wore on her wedding day, is making just 46 replicas of the garment—23 in black and 23 in white (hmm)—and technically, sort of, they’re available to the public. Great news for goth brides, regular brides, and those interested in looking very fancy for a gala, a backyard party, or a regular Tuesday evening. You have to want this bad. You must be willing to fight. The lookalikes will be priced at £3,500 each (about $4,656) and available exclusively at her flagship at 23 Old Bond Street. Plus, clients will need to email 23oldbond.store@stellamccartney.com and receive a personal invitation from McCartney in order to shop the gowns, which will be kept in an exclusive exhibition area within her boutique. Setting aside what might be rude (23 black dresses and 23 white dresses, okay, sure), and focusing on the hoops one must go through in order to acquire one of these garments: The dress is very expensive and the likelihood of getting a personal invitation from Stella McCartney—the daughter of a Beatle—is slim. But, if you really want this dress and are willing to scrap for it, think long and hard about what you’d actually do. Jezebel culture editor Clove Hope offhandedly suggested parkour as an option—not a bad one, but let’s keep thinking. Who would you injure in a non-fatal fashion? What tightrope would you traverse? Would you jump up onto a park bench that is maybe two to three feet off the ground? Have you dreamt of this dress before? Does it haunt your dreams like a wraith, zooming in and out of your mind’s eye? Will you die for this dress? Sacrifice your first born? Prostrate yourself at the altar of a demon god summoned from the pits of hell? Just some thought starters. Have a great day!